yellow, blue, purple, black and customs colors.No matter print your logo by laser printing, or silkscreen printing or color printing, the mini twist usb will be beautiful with your logos.And the metal swivel usb is the best gifts usb for your customers, or lover, but also promotional usb for your company, your business. The mini twist usb is not only suitable for personalized Young people but also for honest business people by its personalized colorful usb shelles, mini usb design, waterproof usb chips, portable usb keychain. 12.Full compatibility with USB 1.1 and 2.0. 13.Capacities: 64/128/256/512MB, 1GB, 2GB, 4GB, 8GB, 16GB. 19.Auto-run, Space partition, Password Protection and boot function. 20.Multiple Operation Systems supported: No driver needed in Windows ME, Windows 2000, Windows XP, Mac 9.x or later, Linux Kernel 2.4 or later.Only Windows 98 and Windows 98SE need the enclosed driver. 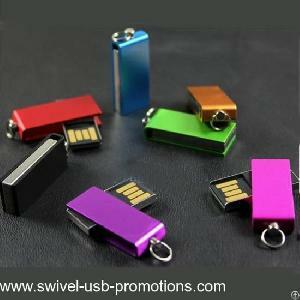 -with exact same mini twist usb with colorful usb shelles, blue, red, yellow, purple and customs colors. -Unique design and creative. The best choice for digital high-end gift business gift.